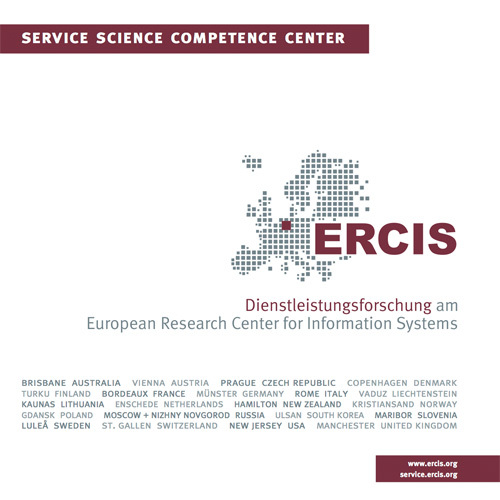 ISeB 2015 | ERCIS Competence Center "Service Science"
An increasing amount of the value propositions offered by public and private organizations are engineered and managed as services that often render innovations for economic growth and social welfare. This trend is reflected in the Information Systems (IS) discipline by designing new models, methods, and software tools that enable innovative business services, using information services as an architectural paradigm for the design of software applications, and providing physical goods and software applications as-a-service. Against the backdrop of this general trend for “servitization”, augmenting physical devices with information technology is an emerging and particularly disruptive development. “Smart” devices—such as smart meters, smart vehicles, and smart manufacturing tools—are equipped with sensors and actuators that allow them to obtain contextual data, exchange these data with other devices and information systems, and adapt their actions accordingly. Thus, networking smart devices with one another and with distributed information systems enables the design and emergence of entirely new services, such as smart mobility, smart logistics, and smart homes. While research on smart services is in its infancy, many issues warrant scientific investigation. On the one hand, smart devices propel new business opportunities and can enable business models to become adaptable to the individual needs encountered by customers. On the other hand, these opportunities might come at the expense of a substantial increase in complexity and unpredictability of the service system, resulting in a need for establishing new paradigms for engineering these systems. The special issue provides a high-quality forum to present and discuss recent research on engineering, selling, and providing smart services based on the design of adequate information systems. All submissions must follow the ISeB editorial guidelines, which are documented on the journal’s website at: https://www.springer.com/business+%26+management/business+information+sy... .
Papers may be 25-30 pages long and should include between 8,000 and 10,000 words (not including references). All submissions are done through the Springer submission system. The tool is linked on the journal’s website (“Submit Online”) or can be found here: https://www.editorialmanager.com/iseb/. Select “S.I. : IS for Smart Services” as article type. Information Systems and e-Business Management (ISeB) is an international journal that focuses on the core tasks of Information Systems Management, the conceptual analysis, design, and deployment of information systems, as well as on all e-business related topics. The central aim of the journal is to publish original, well-written, self-contained contributions that elucidate novel research and innovation in information systems management and e-business which advance the field fundamentally and significantly. Information Systems and e-Business Management (ISeB) has been accepted for Social Sciences Citation Index, Journal Citation Reports / Social Sciences Edition and Current Contents / Social and Behavioral Sciences.